New support cards for Battle Sisters from “We Are!!! Trinity Dragon”, including a new “Battle Sister” G Unit. Act (VC) 1/Turn: [Choose 1 of your face-down cards in your G Zone, flip it face-up] During that turn, this Unit gains “Auto (VC): [Counter Blast 1] When the attack of your “Battle Sister” Unit hits, you can pay the cost. If you pay it, draw 1 card.” and “Cont (VC) GB3 Oracle:: For each card in your hand, all of your front row “Battle Sister” Units gain Power+1000.”. 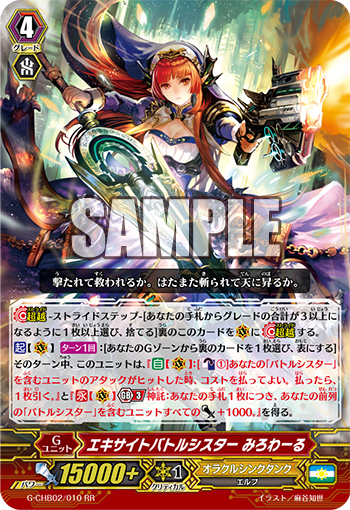 Auto (RC): [Soul Blast 1 – “Battle Sister” card] When this Unit attacks, and you have a “Battle Sister” Vanguard, you can pay the cost. If you pay it, during that battle, this Unit gains Power+3000. For Today’s Card we’re introducing from the Character Booster “We Are!!! Trinity Dragon” (on sale January 13th, 2017), 2 “Battle Sisters” from 《Oracle Think Tank》: The new G Unit “Excite Battle Sister, Miroir” and the Grade 1 “Battle Sister, Rusk”. “Excite Battle Sister, Miroir” has an Act Ability to flip 1 card in your G Zone face-up, that grants an ability of “When the attack of your “Battle Sister” Unit hits, you can Counter Blast 1 card to draw 1 card.”. By bringing out more than 1 “Battle Sister”, you’ll increase your chances of succeeding. In conjunction with the Stride Bonu of “Battle Sister, Madeleine” that we introduced before, when you hit, you get to draw 1 card, and you don’t hit, you also get to Counter Charge 1 card, giving you a win-win situation. And it has another ability. Once you’ve achieved 【Oracle】 (Active when your hand has 5 or more cards in it), you can have all of your front row “Battle Sister” gain 1000 Power for each in your hand. By increasing your Power, it becomes even easier to make your attacks hit. Also, for example, if you have 2 cards in your hand, and “Miroir”‘s attack causes you to Triple Drive, causing you to have 5 or more cards, causing the effect to activate. By increasing the power of your “Battle Sisters”, you’ll be able to launch a super powerful attack! “Battle Sister, Rusk” is an attacker with 【Resist】. When she attacks, you can use a “Battle Sister” in your Soul as the cost to have her gain 3000 Power! With “Resist”, you won’t have to worry about being scared by dreadful G Guardians when you attack like “Interdimensional Dragon, Heteroround Dragon”. It’s an excellent support card you can expect plenty of things from. The Character Booster “We Are!!! Trinity Dragon” contains many cards that support 《Oracle Think Tank》’s “Battle Sister”. Be sure to check out future information!